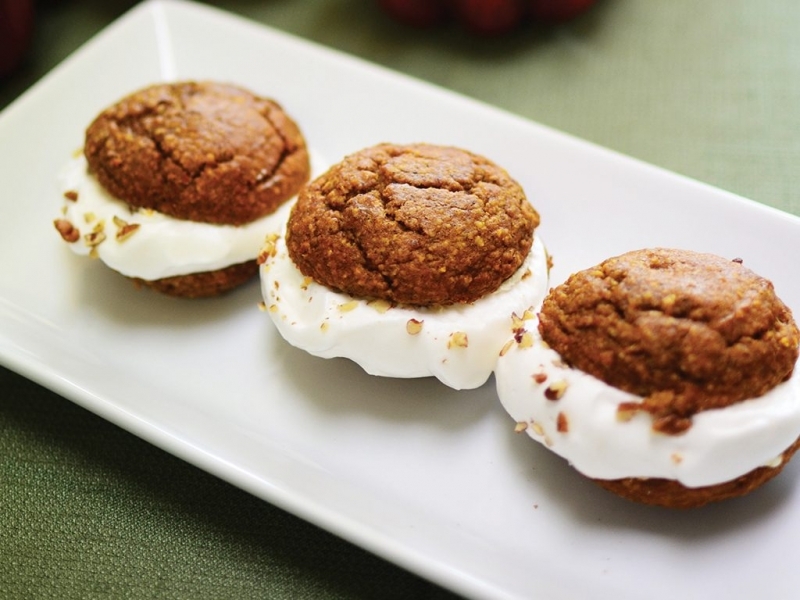 These festive pumpkin whoopie pies contain nutritious complex carbohydrates and heart-healthy fats from ingredients like oats, pumpkin, and pecans. The marshmallow-like filling is made using aquafaba, which is another name for the liquid from canned beans. The liquid acts like raw eggs and can be whipped into a meringue-like substance. Aquafaba can come from any type of canned bean, but garbanzo beans are most often used since the taste of their aquafaba by itself is very subtle and tends to take on the flavor of the other ingredients in the recipe. Use a blender or food processor to pulse the oats into oat flour. Mix with the baking soda, baking powder, cinnamon, nutmeg, cloves, and ginger. In a large bowl, combine the pumpkin puree, honey, melted butter, eggs, and vanilla extract. Add the oat flour mixture to the pumpkin mixture and stir until mixed. Scoop out approximately 2 Tbsp. of batter per cookie onto a baking sheet lined with parchment paper, making about 18 cookies total. Bake at 350℉ for 10-12 minutes or until a toothpick goes into the center and comes out clean. Combine the liquid, honey, cream of tartar, and vanilla extract in a bowl and whisk on high speed with a stand or hand mixer for 12-15 minutes until thick and fluffy. Spread the filling on half of the pumpkin cookies and sprinkle with pecans. Top with another cookie, and eat immediately. If the whoopie pies will not be eaten immediately, spread a very thin layer of cream cheese on the surface of the cookies before adding the filling.